Weight : 454 kg (~1000 LBS) plus weight of user and mission package. Status : In active use by US and Canadian based ACTF. Description : The Green Type Cybernetic Battle Armor is the third battle armor to have been developed by the U.S. to counter the advantage that even a low level Zoanoid has against the typical human soldier and the lower class Hyper Zoanoids. Possessing superior dexterity, mobility, speed, and strength enhancements than the previous Red and Blue Type Armors. 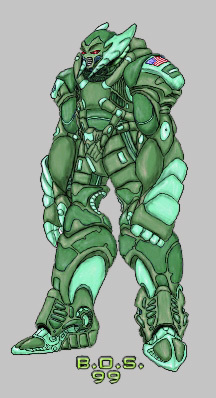 The Version 1 Green Type is already stronger than the Gregole Class Zoanoid by a factor of 2, but these Green Type units are also designed to be upgrade able and to include mission specific weaponry, making it the most lethal human designed armor yet. Present estimates of the Green Type abilities have been compiled and summarized below. -Physical Strength: Armor strength enhancement has been approximated to be equal to that of thirty men, which makes it twice as strong as the Gregole Class Zoanoid. -Speed: Armor provides the wearer with the average range of movement and mobility as they would normally have unarmored as well as enhancements due to the built in jets that allows unit hovercraft level mobility up to 160 MPH and with the ability to jump over obstacles as high as forty feet. -Durability: Armor is an evolutionary step forward from the Blue type V1, the Green armor utilizes similar composite armor as the Blue type V1 but adds an energy shield system similar to that used by the Robo Guyver armor types, before they had been discontinued. Though not as powerful, the shield system improves armor durability to a level that can withstand a Vamore bio-laser blast with minimal surface damage. -Sensory Perception: Armor is equipped with advance H.U.D. tactical display, providing auditory and visual enhancers that respond automatically to changing combat situations. -Weapons: Armor can be equipped with a variety of weapons including arm mounted electric guns that fires 20 mm H.E. caseless armor piercing rounds, short range guided mini missile shoulder mounted pods (optional, depending on mission specifics), jack hammer armor piercing wrist mounted spike for close range combat (Concealed within gauntlet when not in use), and laser targeting system that is of sufficient power to blind the average Zoanoid, but unlike older versions of human Battle Armor, the Green Type V1 is designed to be upgradeable and easy to equip weapon add-ons can give the armor a variety of different mission specific capabilities when needed. Other abilities and tools can be added depending on the combat situation the unit will be put in. -Power System: Armor is powered by a dimensional coupler device similar to those first used in the Robo Guyver armor series and provides armor with an unlimited reserve of energy in a manner similar to the Warrior Guyvers HSL, by tapping higher dimensions to produce a near limitless supply of energy.